One of the lesser-known coastal resorts on the island, Candelaria is located in the north east of Tenerife, just a short drive away from Santa Cruz. This area is not so much a tourist resort as a small Canarian village with deep-rooted religious connections that people visit on day trips by the coach-load. Most importantly, the village is home to the Virgin of Candelaria and the Basilica, two religious features that people travel from all over to see and experience. 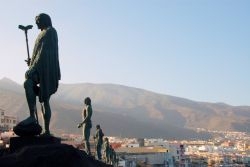 The statue of the Virgin of Candelaria –often called Our Lady of Candelaria – carries a child in one hand and a green candle in the other, representing the supposed apparition of the Virgin Mary in Tenerife. The Basilica is considered to be the main temple dedicated to the Virgin Mary in the Canaries and in addition to religious visitors, the building also attracts art enthusiasts, who travel for the impressive architecture of the church and the large collection of paintings within. If you’re not into religious buildings or art, the village’s main beach might be more your style. Sporting Tenerife’s signature black volcanic sand, this beach is an ideal place to chill out in the sunshine or splash about in the waves. The number of restaurants in Candelaria is limited, but if you search around enough you’ll find a few hidden gems. Most eateries serve either traditional Canarian cuisine with simple yet delicious flavours or fresh seafood that was swimming in the Atlantic that very morning. To make up for the lack of restaurants, Candelaria is home to several small cafes where you can stop off for a break and indulge in a cafe con leche and a cake. Peppered amongst the cafes, you’ll also find various florists, ice cream stalls and souvenir shops where you can pick up a trinket to remind you of your trip. If you’re looking for a relaxing break away from the bustling tourist resorts of the south, Candelaria is the place to visit.